Zifonyl Capsule Box containing 5 X10’s Capsules in blister pack. Zifonyl is the combined preparation of Carbonyl Iron, Folic Acid and Zinc Sulphate Monohydrate. Carbonyl Iron is the elemental form of iron having 98% iron content. Carbonyl Iron is a safer and effective choice for Iron supplementation having high bioavailability and low toxicity and gastric irritation. 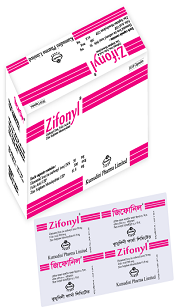 Zifonyl is indicated for the treatment and prophylaxis of Iron, Folic Acid and Zinc deficiency. It is indicated for use in improving nutritional status of women prior to conception, throughout pregnancy and in the postnatal period both lactating and non lactating mother. Special care should be taken in patients with Iron overload states, such as haemochromatosis, haemolytic anaemia or red blood cell aplasia. Failure to response to the treatment requires further investigations to exclude other causes of anaemia. In patients with renal failure there may be the risk of Zinc accumulation. Carbonyl Iron decreases the absorption of tetracycline antibiotics, quinolone antibiotics, levodopa, levothyroxine, methyldopa and penecillamine. Folic Acid interacts with antiepileptics, so plasma concentrations of phenobarbital, phenytoin and primidone are possibly reduced. Store in a cool and dry place, keep away from light and moisture. Keep all medicines out of the reach of children.